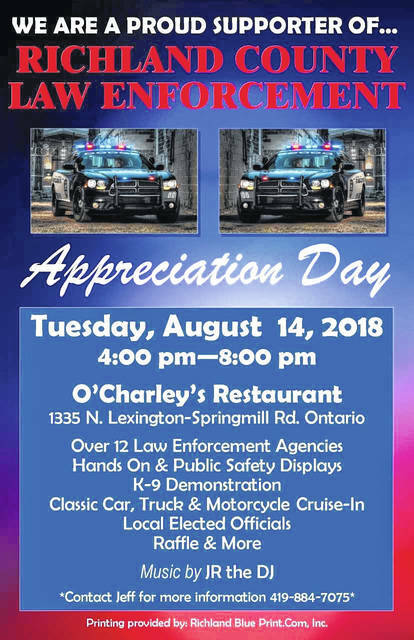 ONTARIO — This year’s Richland County Law Enforcement Appreciation Day is planned for Aug. 14, from 4-8 p.m. This will be the third year for the event and O’Charley’s Restaurant in Ontario will once again play host. Last year’s event drew a large crowd. 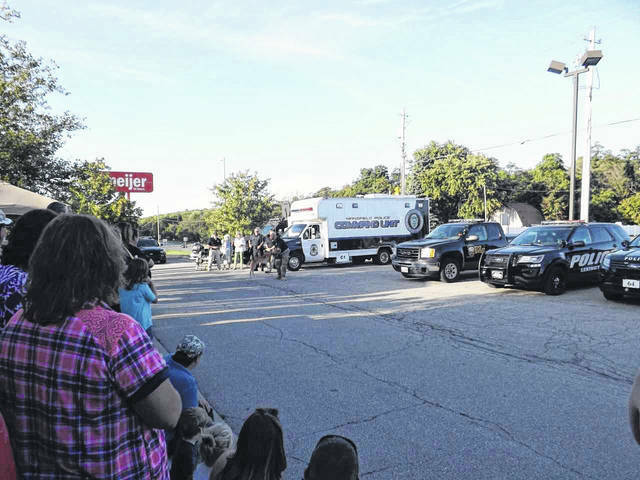 Local residents were given a chance to meet police officers from all branches of Richland county. Every branch has been asked back and are expected to attend this year’s festivities. Those in attendance will be Richland County Sheriff’s Office, police departments from Mansfield, Ontario, Lexington, Shelby, Bellville, Crestline, Plymouth and Butler, park rangers from Charles Mill, Pleasant Hill and Clear Fork, also expected is Richland County Game Warden Greg Wasilewski. Various elected officials from throughout the county will also be on hand. Features for this year’s show will include public and hands-on safety displays; a K-9 demonstration, multiple police units, local elected officials and a classic car, truck and motorcycle cruise-in. Blue lights will be given out for resident front porches to show support of law enforcement. A raffle will also be held during the show to help offset the costs. The raffle will be open everyone at the show. Last year, officers from the county and cruisers at the show were given plaques. And the show is currently looking for a sponsor for the plaques. New this year, the show will offer limited spaces to local businesses, organizations or groups that would like to be a part of the event. These spaces will be available on a first-come, first-serve basis. Interested people should contact the coordinator early. The committee for the event has been active throughout the county, seeking help by personal contact, mail and through emails to promote the show as well as collecting raffle items. Any non-parishable donation suitable for raffle would be welcome, and credit for the donation will be noted. Businesses, organizations or individuals needing more information or who would like to donate to the show can contact Jeff Rickel at 419-884-7075. Checks can be made out to “Law Enforcement Day – Jeff Rickel, Coordinator”. All monatary donations can be sent Jeff Rickel, P.O. Box 3338, Lexington, Ohio 44904.